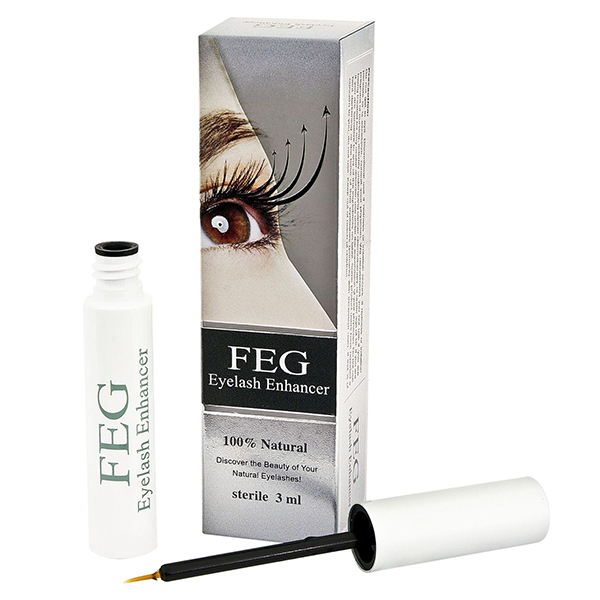 Feg eyelash enhancing serum comes in an aesthetic bottle. It has subtle colours (white and mint green). Its main task is stimulating eyelash growth and conditioning the lashes with natural ingredients included in the serum. The producer assures that Feg eyelash enhancing serum contains fruit and green tea extracts that nurture the lashes and lock in moisture. Sadly, there are no natural components in the serum. Undoubtedly, Feg serum will condition the lashes and slightly boost their growth. On the other hand, many women say that Feg serum makes their lashes grow in different directions, which has been confirmed by a high percentage of ladies. The application is quite troublesome – the flexible brush doesn’t allow to spread the serum precisely. To make things worse, the serum is slowly absorbed – it takes up more or less 5 minutes. That is why, you should apply Feg eyelash enhancing serum in the evening, before going to sleep. We are pressed for time in the morning and every minute counts so it is quite irritating to wait until the product gets absorbed. You shouldn’t put on make-up before the serum totally penetrates inside the skin. You must be careful while applying Feg eyelash enhancing serum. Although the manufacturer claims that the product includes lots of natural ingredients, we couldn’t notice any of them in the composition. When you apply the serum, you must observe your eyes and make sure that the liquid doesn’t drip off the eyelid. The applicator is poor and you must learn to use it. Feg serum should be applied in the evening as it is very slowly absorbed.